Our 1" thick carbonized bamboo desktops come rectangular or curved. The curved top helps you comfortably reach more of your desktop. Standard V2 frames work for most users, but for ANSI/BIFMA compliance, our commercial V2 frame is able to adjust 2" lower for users from 5'0" to 6'3". Our 1" thick Bamboo desktops are available in a many different sizes and shapes, including the option of getting one with a center cutout with an ergo edge. Our 1" thick Laminate desktops are GREENGUARD-Certified and come in white, black, cherry, ash gray, walnut, or maple laminate finishes. For a desk that lets you write down your ideas and lists and then erase them when you're done, our Laminate whiteboard desktop is an excellent choice to help you showcase your creativity. Eco Curve UV-cured desktops are made of 100% recycled powder-coated wood composite and are available in black or white color options. Our Eco Curve is designed with a gently sloping curved front edge, allowing you to reach more of your desktop and rest your wrists on the edge of your desk. Rubberwood is an environmentally friendly wood harvested from retired Hevea brasiliensis trees. The lumber is durable and makes for a solid wood desktop that resists breaking or warping. The 13/16" thick Rubberwood Desktop is available in a natural or a dark brown finish. Both finishes feature striking wood grains. The natural finish makes for a soft, eye-pleasing desktop, while the Dark Brown is striking and more of a chocolate brown. Enjoy the look of luxurious solid wood with less of the lead time with our selection of in-stock Solid Wood Desktops. At 1.75" thick, these handcrafted desktops are durable, will stand the test of time, and look good while doing it. We have genuine wood options like Pheasantwood, Premium Walnut, Natural Ash, African Mahogany, and Acacia, all of which boast unique wood grains unique to their species. With all of these real wood options, you're sure to find the beautiful desktop that truly sets your desk, and your style, apart from the rest. For expert advice on how to keep your solid wood top looking great, including how to care for and repair your desktop, please read our wood desktop care and repair instructions. The UPLIFT V2 Adjustable Height Desk is available in several standard sizes. All desktops are 30 inches deep and vary from 48" to 80" wide. Looking for a smaller desktop? The UPLIFT Space Saver Desk has our most popular desktops in 24" depths. We've listened to what you want in a standing desk: power, safety, a height that fits you perfectly. Our new UPLIFT V2 Frames are upgraded in big and little ways that matter, with smart V4 control boxes packed with advanced features found in our desks alone. Newly-included 6-axis accelerometer technology with more precise anti-collision sensitivity ensures our desks are safer when adjusting. Your desk will sense unwanted collision with a person or object within 5 milliseconds when adjusting the height, and stop and slightly reverse, to stop accidents before they happen. Keypad Lock is another new safety feature that lets you lock your keypad, so you're the only one with access to adjust your desk - a feature especially helpful in home offices with small children present. Let's talk about power. Our three-stage legs move your workstation 33% faster than two-stage frames, so you spend less time waiting for it to raise and lower. Powerful motors in each leg give you a higher weight capacity than 2-stage frames, to ensure your desk can bear all the gear you need. Work with assurance that you've invested in a desk that's powerful enough to do the heavy lifting at your workstation, while encouraging you to work in more ergonomic postures throughout the day. Factor in a powerful, whisper-quiet motor in each leg that is brawny enough to lift hundreds of pounds without losing desk stability, and you have the most well-designed standing desk frame that money can buy. Build the desk you've always wanted from the ground up with a frame by UPLIFT Desk. Where other standing desk makers offer 2-stage frames standard, with a reduced range of motion that can't accommodate petite and very tall users in ergonomic comfort, so they can mark up a 3-stage desk as "extended range" for more money, we offer only the most affordable, reliable, fastest adjusting, and quietest height adjustable desks with our 3-stage frame. The V2 frame makes your desk easier to put together than ever, and once it's set up you'll be able to add accessories that are designed and made to hook right into place at your new desk. Built-in accessory mounting points accommodate desk extensions, hammocks, and a variety of future accessories so you can optimize your workstation your way. This sleek and versatile frame boasts discreet hidden hardware, and an included wire management tray easily attaches to the back of your desk, so you can stash cords and even a surge protector inside to raise and lower with your setup. These thoughtful design details allow you to really show off what's important while hiding what's not. With all the benefits of our UPLIFT V2 Desk frame included, the UPLIFT V2 Commercial Frame features an even wider height range of 22.6" to 48.7" with a 1" desktop installed, which reaches 2" lower than our standard desk. This height range makes the desk frame ANSI/BIFMA G1-2013 compliant, a height standard used by many companies to accommodate users from 5'0" to 6'3". We've reduced unwanted desk movement, such as side-to-side or front-to-back wobble, at the most extreme range of extension, thanks to a sturdy steel crossbar that provides maximum stability at any height. We recommend installing the crossbar if you plan to use your desk at its highest height settings. While our standard frame will work for almost all users, the UPLIFT V2 Commercial Frame is an ideal solution for users who are very petite or very tall, users who desire a low height in combination with casters that add height to the desk, and offices that choose ANSI/BIFMA G1-2013 compliance to accommodate the greatest number of potential employees. Users of either frame can benefit from the ergonomic advantages of our accessories, including keyboard trays, monitor arms, and footrests, which encourage sitting in healthy alignment. Meet the smartest, most adaptable, and safest sit-stand desk on the market—the UPLIFT V2. Chosen as the "Best Standing Desk" by both Wirecutter and Forbes, UPLIFT Desk added loads of exciting, new features to the UPLIFT V2 Frame, all included to help you work better. We're also excited to present to you the UPLIFT V2 Commercial Height Adjustable Desk, which meets the important ANSI/BIFMA G1-2013 height standard that many offices must comply with today. In both cases, the designers at UPLIFT Desk took their powerful frame and made it even sturdier and more adaptable, with innovations in safety, design, and functionality. No matter which frame you end up choosing, rest easy knowing you'll be working at the most advanced sit-stand desk available. Click here to learn more about both of them and compare their differences. Customize your desk and create the workspace that's right for you—all in just a few clicks. Choose from desktop styles including bamboo, GREENGUARD-certified laminate, whiteboard, eco curve, and numerous species of solid wood, all in sizes to suit your needs and fit your space. So many options! In the desk builder at the top of this page, you can choose from bamboo, laminate, whiteboard, eco curve, and numerous species of solid wood desktops. If you're looking for a different shape, check out our L-Shaped, Curved Corner, and 120 Degree Standing Desks. We also offer made-to-order Solid Wood 2-Leg Desks, and made-to-order Solid Wood L-Shaped Desks or Custom Laminate L-Shaped Desks. UPLIFT Desk offers you a wide array of desktop options, letting you select the exact components that, together, make up your perfect desk. Choose from durable GREENGUARD-certified laminates, environmentally friendly 1"-thick bamboo, or several species of beautiful solid wood—at least one is sure to satisfy your taste and budget. These desktops are made and finished with eco- and air-safe materials, so you can breathe easy knowing your desk is good for you and for Mother Earth. Our solid wood and bamboo desktops are finished with natural, environmentally friendly sealants, while our GREENGUARD-certified laminates have been tested and meet strict chemical emissions limits for use in indoor spaces (which is not something every laminate desktop maker can say). Learn more about our desktops by checking out our desktop brochure pdf. 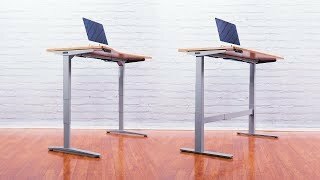 What Sets the UPLIFT Desk Frame Apart? Which Frame Should You Choose? The primary difference between the two frames is their height range. Want a quick summary of the differences? Click here for a detailed look at the UPLIFT V2 Frame and the UPLIFT V2 Commercial Frame. The UPLIFT V2 Frame features a height range of 25.5" - 51.1" with a 1" desktop installed. This popular frame is remarkably sturdy, quiet, and comes with advanced features found in UPLIFT V2 desks alone. This frame was even selected as the "Best Standing Desk" by Wirecutter. By contrast, the UPLIFT V2 Commercial Frame features a height range of 22.6" - 48.7" (with a 1" desktop installed). This frame has a lower starting height, a lower max height, and a larger overall height-adjustment range than the UPLIFT V2 Frame. Created specifically to meet the ANSI/BIFMA G1-2013 height standard, which is required by many of the world's largest companies, it also meets the ANSI/BIFMA durability standard (as does the UPLIFT V2 Frame). A lower crossbar is included in its design to further increase stability. The UPLIFT V2 Commercial Frame supports ergonomic working postures for 5th percentile females through 95th percentile males, in both seated and standing positions. Boasting the world's most advanced height adjustable standing desk frame, UPLIFT Desk took their most popular design to even greater heights, with improvements in overall stability and safety. Add to that its patent-pending features, and it's no wonder Wirecutter named it the "Best Standing Desk." Engineered for fast and reliable height adjustments thanks to two separate motors (one in each leg), the UPLIFT V2 Frame is powerful enough to withstand the trials and tribulations of the work week, even on Mondays. With a revolutionary inverted leg orientation, which gives us the space we needed to weld steel stability braces to the top of each leg, your UPLIFT V2 Standing Desk minimizes side-to-side wobble, even without a lower crossbar. Because of its 3-stage legs, your desk can adjust 33% faster, and comes with a 33% greater height range than desks with 2-stage legs. Lastly, take a look at the new patent-pending mounting point system on the frame, which gives you the ability to quickly and easily attach a wide range of accessories—right to your desk frame. The UPLIFT V2 Commercial Height Adjustable Desk Frame was designed to provide a seated and standing height range that supports 95% of working postures, from a 5' tall seated individual to a 6'3" standing person. That means this frame meets the ANSI/BIFMA G1-2013 height standard that many of the world's largest companies require. The main difference on the UPLIFT V2 Commercial Frame is its height range. Specifically designed to meet the ANSI/BIFMA G1-2013 height standard (a requirement for many work environments) this frame ensures an ergonomic desk height for a 5' tall user (5th percentile). Both frames are designed to accommodate up to a 6'3" user (95th percentile). Both frames are reinforced for a stable working experience, but they achieve this in slightly different ways. The UPLIFT V2 Frame utilizes stability braces, while the UPLIFT V2 Commercial Frame has a stability crossbar. All height adjustable desks have one or the other component, to help increase stability at all heights. You may also notice a difference in the legs on the UPLIFT V2 Commercial Frame: those are telescoping leg sections in its lifting columns, which overlap less when extended to maximum height. This means we couldn't add stability braces to this design. To ensure a stable experience, our designers included a stability crossbar and made the frame's legs thicker—reducing wobble at even the tallest heights. Click here for a more detailed look at the UPLIFT V2 Frame and the UPLIFT V2 Commercial Frame. Your desk comes with 48 built-in, patent-pending mounting points, a new feature that allows you to install accessories directly to your frame. All of the holes are built discreetly into the frame and remain hidden under the desktop, so you can maintain a clean and organized look at your workstation. You can even hang a hammock underneath your desk, it's so sturdy—something no other standing desks offer. With many more frame attachments to be released, such as CPU holders, desk extensions, and power strips, you pick the accessories to customize your desk in all the right ways. Note: The Under Desk Hammock by UPLIFT Desk is only compatible with the UPLIFT V2 Frame. It's not compatible with the UPLIFT V2 Commercial Frame because it interferes with the stability crossbar. When you upgrade to the Advanced Keypad, you get to enjoy so much more control, starting with one-touch adjustments on four programmable memory buttons. These enable you to transition between sitting and standing positions quickly and easily. You'll also get advanced safety features, including anti-collision sensitivity and a keypad-activated child lock. You can work with confidence that if your desk ever does come into contact with objects or people, it will stop within fractions of a second for safety. Turn on the child safety lock and your desk will only adjust when you want it, protecting curious little ones in your work area. Using the Advanced Keypad, your desk's maximum and minimum heights can also be adjusted, meaning you can set upper and lower height limits. This helps prevent your desktop from knocking into shelves above (or file cabinets below). If you're wondering about the easy-to-read lights on the keypad distracting you, never fear! The keypad's auto-dark LED display will dim 10 seconds after use, reducing the time you spend getting back to business. ANSI/BIFMA G1-2013 Height Standard UPLIFT V2 Commercial Frame is ANSI/BIFMA G1-2013 Height Standard compliant. Warranty 7-year all-inclusive warranty on entire desk base: motor frame, controller, keypad, electronics, and mechanisms included. Extension to 12 years available. What type of desktop materials will I get to choose from? On this listing you'll be able to shop from a wide selection of GREENGUARD-certified laminates, laminate whiteboard, environmentally friendly eco, 1"-thick carbonized bamboo, and several species of genuine solid wood. What desktop sizes can I use with the UPLIFT V2 Frame? The UPLIFT V2 Frame is designed to be compatible with all UPLIFT Desk tops ranging from 42" to 80" wide. Can I assemble this desk by myself? While assembling the frame and attaching it to the desktop can be done by one person, we do recommend having a friend there to help you to turn it upright after assembly. If you want to see the whole assembly process, you can watch Gene assemble an UPLIFT Desk. Laminate desks with GREENGUARD certification have been tested rigorously by an independent third party laboratory, and have been shown to meet strict guidelines about chemical emissions such as formaldehyde, so they are guaranteed safe for indoor use. All of the laminate desktops you see here are GREENGUARD certified. Is there a difference between the bamboo you offer versus the bamboo offered by other desk manufacturers? While most desk manufacturers offer a 3/4"-thick bamboo desktop, our bamboo desktops are a full 1" thick, making them even more sturdy and durable for years of work. The additional thickness also allows it to resist sagging, even on wider desktops. How do you seal your desktops? All desktops by UPLIFT Desk are sealed with high-quality European E1-level adhesives and a water-based protective coating, neither of which off-gas or emit VOCs, keeping your indoor air quality pristine. $495.00 List Price: $1,499.00* The list price is the same as the MSRP (Manufacturer's Suggested Retail Price). It may not necessarily be the price at which the product is sold.